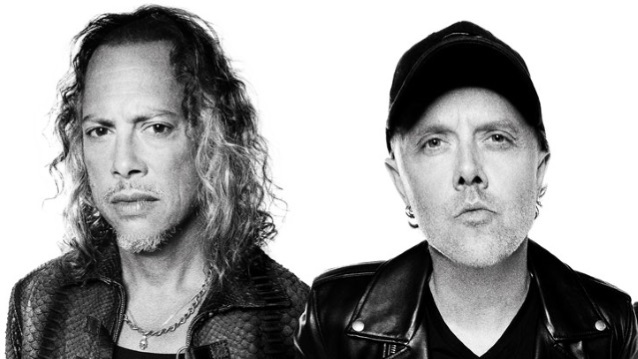 In a brand new interview with Rolling Stone, METALLICA drummer Lars Ulrich and guitarist Kirk Hammett looked back on the band's final show with bassist Cliff Burton. The gig, which took place on September 26, 1986 in Stockholm, Sweden, is included on the upcoming super-deluxe, box-set reissue of METALLICA's touchstone 1986 LP "Master Of Puppets", due out on Friday, November 10. Asked if it was emotional listening to the cassette of Cliff's last show, Lars said: "Obviously, we're 31 years past this. So you pause, you reflect, you think, you appreciate, you're humbled. I move so fast through a lot of the stuff that I never slow down long enough to reflect. And occasionally, when you sit with some of the stuff at 2 o'clock in the morning, you go, 'Wow.' When you sit there and listen to the last two songs or look at the pictures from the last show with him, it stops you in your tracks as you deal with it." Pressed about what he remembers about the final show with Cliff, Lars said: "We'd finished playing all the 'Odeons' in England, which are these old, 3,000-seat movie theaters and we got to Scandinavia where they were more like ice-hockey holes — smaller, colder, darker. It was a different vibe. We played the show in Stockholm, and it went incredibly well. I think it may have been a rare case where we actually played an additional song that wasn't on the set list, because the show was so good. That's not something we did a lot then or now. So there was a good vibe." Added Hammett: "It was significant because it was the first show where James [Hetfield] played guitar again. He strapped on a guitar and was able to play the encore; I think it was 'Blitzkrieg' or something. But I remember the five of us, including [fill-in guitarist] John Marshall, being really stoked James was back and playing and looking like was gonna make a pretty healthy recovery. I distinctly remember that show being good, and the feeling when we got offstage was really great and positive and forward-looking. Like, 'Great, James is back in and it won't be long 'til we're back to our old selves again.' It was that kind of mood after the show and then the accident happened and it literally felt like we were going from a hopeful sort of circumstance to one where we found ourselves in into a deep, black pit." Continued Ulrich: "We did a lot of press that day, and we did a photo shoot for a Swedish magazine called OK, which was almost like a teenybopper magazine. We were sitting on the bus afterwards, talking about how cool it was, and Cliff and I were hanging out, having a beer. It's a little fuzzy now but it was a good day." Said Hammett: "I remember right when we were about to leave in the bus, the fans started running towards us. And Cliff said, 'Look at them. They look like zombies!' He was way into zombies. We were all just kind of laughing. Then we started playing cards. And we had a long, long drive. And everyone knows the rest of it." On September 27, 1986, Burton lost his life at the age of 24 in a coach crash near Ljungby, Sweden. His huge talent and achievements were chronicled in book form with the 2009 global publication of "To Live Is To Die: The Life And Death Of Metallica's Cliff Burton", written by U.K.-based author Joel McIver and published by Jawbone Press. The foreword was provided by Hammett.